We leave Provence and travel west to Bordeaux and discover the regional speciality that is the Cannelé. Customarily, these little pastries are eaten for breakfast, a snack as a dessert. Anytime! Fresh out of the oven, the fragrant rum and vanilla infused delicacies boast a crunchy and golden crust that gives way to a dense, yet creamy, custardy centre. A unique trademark of the Cannelé is the baking technique, which traditionally uses copper moulds coated with beeswax. Beeswax will not burn at the high temperatures necessary to bake these pastries, and aids the caramelisation process that provides the characteristic golden crust. The drawback with using copper moulds is they are not cheap. But the good news is somewhat similar results can be achieved baking with tin and silicon moulds. 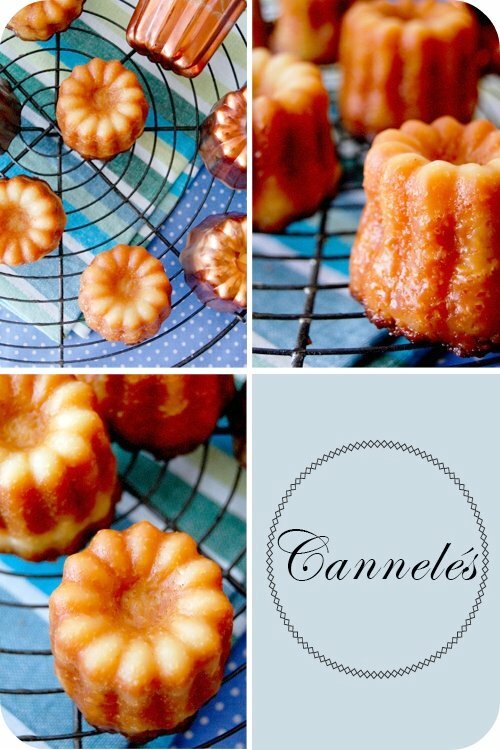 Of interest, the name Canelé de Bordeaux is reserved for the custardy cake found exclusively in the city, with Cannelés Bordelais the label given to any version outside of Bordeaux. Despite using copper and beeswax as part of the process, these pastries did not crust as dark as I would like. Perhaps the oven should be even higher? But now that investment in copper moulds has been made – and I have enough beeswax to coat them 100 times over! – a perfect excuse for more trials until I achieve that perfectly dark crust. Note: this is not a recipe you can pull together last minute. The moulds need preparation, and the batter must be refrigerated for 1-4 days in advance. But well worth planning ahead. Bring half the milk, butter and vanilla to a simmer and cook until butter has melted. Allow to cool. In a bowl, whisk together egg yolks, sugar, rum and remaining milk. Add the flour and salt and whisk to combine. Add the hot milk mixture to the egg yolk mixture in a slow steady stream. Strain through a sieve. Cover and refrigerate for 1-4 days. Preheat the oven to 400F or 200C. Prepare the moulds. (See tip below.) Remove batter from the refrigerator and whisk vigorously. Fill each mould to 1/8 inch or 3mm from the top. Bake, rotating sheet halfway through, until Cannelés are dark brown and slip easily from their moulds, about 1 1/2 to 2 hours. If you are using tin moulds, coat with butter or oil and freeze for 30 minutes prior to baking. If you are using silicon moulds, you have two options. Due to the non-stick nature of the silicon, you can use as is. Alternatively, you can brush with some butter or oil, and freeze for 30 minutes in a similar fashion to a tin mould above. If you are using copper moulds, you also have two options. Heat the moulds in the oven at the same time as melting some beeswax. Then carefully coat the hot moulds with a thin layer of wax. Let the excess drip for a few minutes. Alternatively, you can brush with some butter or oil, and freeze for 30 minutes in a similar fashion to a tin mould above. You feel you are there with them. Peter Mayle and his wife in Luberon, Provence, in the vivid, light-hearted autobiographical story, A Year in Provence. Before the end of the first page, I was utterly charmed. You are transported to the south of France, and share the adventures of a year, with Peter and his wife, in this striking part of the world. I close my eyes and instantly see every inch of detail described. From the 200 year old stone farmhouse the author bought, the grape vines on his property, his charming and sometimes unconventional neighbours, the clandestine tricks of the locals during truffle hunting, the dramatic changes in weather, and the endless food and gastronomic meals. Peter speaks of a visit to Aix, and colourfully illustrates his observations the local student population. The entertaining performance of the arrival, greeting and the ritual kissing of the students. I read with a smile on my face, as I can picture each move. Then my eyes wander to an illustration in the book. 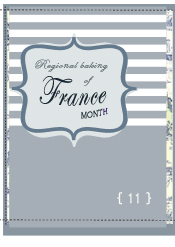 A young girl sitting in a café, with the obligatory glass of Pastis, joined at the table by a box of Calisson d’Aix. Calisson d’Aix is a speciality of Aix-en-Provence. A tiny diamond shaped sweet, made with ground almonds and candied fruits and finished with white royal icing. They are traditionally served with coffee after dessert. Admittedly, I have been enjoying any time of day, and believe they would be a delightful addition to any holiday season table. The addition of orange flavoured liqueur to the almond candied fruit mixture, is simply festive. 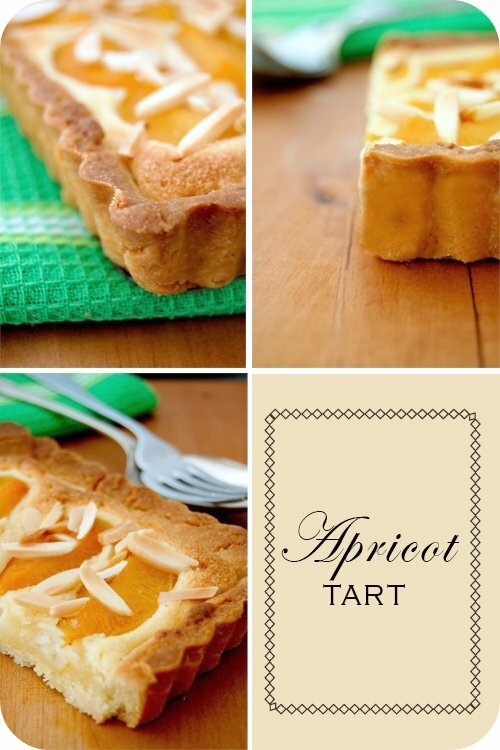 They are very simple to make, and a perfect make-ahead sweet. The almond mixture comes together quickly, and then dries overnight. The royal icing is then applied and allowed to set. Lastly, the sweets are cut into the distinctive diamond/petal shapes. I simply used each side of the round cookie cutter to mimic a diamond/petal shape. Too simple for words – and no new shape required. See ‘both A + B’ attached if you are unfamiliar with the Venn diagram. I noticed many recipes included a candied melon that I was having much difficulty in obtaining. So I was happy to find this version by Jacques Torres that omitted the melon, and included a healthy dose of Grand Marnier. The candied orange I use is quite soft. You can candy your own or buy it in the store. If the one you buy is hard, rehydrate it in some sugar syrup. Use an offset spatula to spread a 1/16-inch thick layer of Royal Icing on top of the rolled almond paste. Place this in the freezer until the Royal Icing sets, about 30 minutes, uncovered. Use a sharp chef’s knife coated with vegetable cooking spray to cut the Calisson d’Aix into diamond shapes. Combine the egg white and powdered sugar in a medium-size mixing bowl and whip with an electric mixer on medium speed until opaque and shiny, about 5 minutes. Add the lemon juice and continue whipping until completely incorporated, about 3 minutes. The lemon juice whitens the royal icing. The royal icing should be light, fluffy, and slightly stiff. You may need to adjust the consistency by adding more egg whites if the icing is too dry or more powdered sugar if it is too wet.